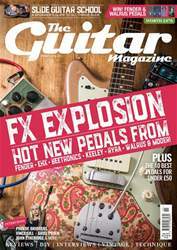 Hi guys, I was very interested to see the article in October’s issue about the Maton guitar George Harrison had loaned and played in 1963. My late brother played in the resident band at Jersey’s Springfield Ballroom, The Rob Charles Combo, and was present when The Beatles played there in 1963, during the period when George was using the Maton. The Beatles didn’t bring any amps with them, and so George played through my brother’s new Fender Super for the gig, which apparently he loved!